We didn't go to see the Pope yesterday. It's a long story and I'll tell you later. I'm sad about it, but I'm choosing to focus on who did go to see the Pope yesterday and just how extraordinary his day was. Let's begin about two months ago. Our family has been pondering some big decisions and we've added some new prayer intentions in the past few weeks as well. When first these things popped up, I asked Mike to make some time to go to adoration. I was fine with whatever decisions we made and whatever events unfolded, I just wanted to know he had spent some quality time mulling it over with Jesus. But Mike's been traveling and busy and even on the day he'd set aside in early March to sit in the Blessed Sacrament chapel at the Shrine, he was interrupted. The production team wanted to go over every detail of the Pope's time there in light of Secret Service requirements. Mike was there for hours, but he never got any time alone with God. And I admit to being very frustrated. That was well before Holy Week. And I began an incessant prayer campaign. I wasn't necessarily pleading for any outcome; I just wanted him in front of our Lord for a chunk of time. I switched my wedding ring to my right hand and every time I noticed it, I prayed he'd have adoration time. Weeks later, I wasn't even noticing the ring was on the wrong hand any more, so I took it off altogether so I'd remember to pray. And then that became "normal." So I put the ring back on. Dozens of times every day, I asked God to call my husband to Him. Mike left the house early yesterday to drive down to his office to meet Jimmy, Christian's godfather. Together, they needed to drop by the Secret Service headquarters to have Jimmy's picture re-taken for his press credential. From there, they would continue on to a DC hotel where the press corps for the Shrine visit was sequestered before being escorted to the Shrine by the Secret Service. 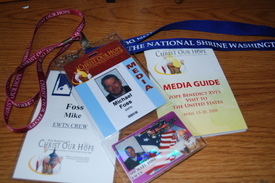 Usually, Mike is the director for EWTN events at the Shrine. He sits in the truck outside the building and calls the shots. On this glorious day, though, he was going to run camera. That way, he'd be in the same room with the Holy Father. But which room? The Secret Service wanted everyone in his place three hours before the Pope arrived. 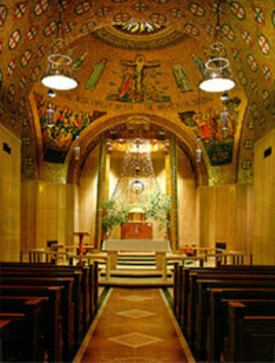 Mike's "place" was the Blessed Sacrament Chapel. For three hours, he sat alone with his camera and Jesus and awaited the Holy Father. Then, from behind that camera, he prayed with the Pope in front of Our Lord! The Pope went on downstairs to the Crypt Church for Vespers and to address the Bishops' Conference. The Secret Service told Mike to stay right where he was. Until the Pope left the building. For six hours, on the Pope's birthday, in the company of the Pope for some of the time, my husband sat in the Adoration Chapel of our favorite church. God answers praying wives with great generosity, doesn't He?